Water is life! Clean water is necessary for human consumption and vital for good health. Josh Fritsch from the Village of Montpelier Water Treatment Plant was guest speaker for the regular meeting of CHWC-Montpelier Hospital Auxiliary Monday afternoon, Feb. 9th in the hospital conference room. Auxiliary President Joyce Schelling called the meeting to order and welcomed everyone. Vice President Armeda Sawmiller introduced Mr. Fritsch. The original water treatment plant was built in 1939 and serviced the village for many years until a new treatment plant was built in 2005 at a cost of $7.5 million. The cost could have been much higher if construction had been delayed—steel prices skyrocketed six months after the steel prices were secured. The new plant enabled having most equipment housed inside the building. There are two employees on staff for plant operations which are capable of processing two million gallons of water per day. Normal consumption levels only require operating eight hours each day. A significant increase in industrial water consumption in future years could require a second shift at the plant. In 2003 the Montpelier plant won the national water tasting competition and usually places in the top five. Last year the local plant placed fourth. Water comes from four ground wells which were drilled to 200 feet with screens installed at 60 feet. Water treatment includes the addition of lime softening which softens the water. An extra benefit is that it takes all the iron out of the water. Acceptable levels of chlorine are maintained throughout the system. Rules and regulations of the Ohio EPA must be followed. Testing is done regularly every three to four hours daily in the lab at the plant. The Ohio EPA conducts annual inspections at the facility and there is a possibility of unannounced inspections anytime. The village has three water towers which hold reserves of one million gallons and provides excellent pressure in the distribution system. Without the towers, water would need to be pumped on a continuous basis. In addition to providing more storage, the water towers also help to lower fire insurance costs. A contingency plan with surrounding communities is in place in the event other water sources would be needed. Montpelier’s water treatment plant is a Class 2 plant according to the Ohio EPA, with technicians with Mr. Fritsch having a Class 3 license and Mr. Peters, a Class 1 license, studying for his Class 2. Training is ongoing for certification and there must be at least one plant employee with a qualified water treatment license. The village underwrites the cost of 24 hours of continuing education required per year in classes offered by the Ohio EPA and some sessions are offered at no cost. Half of the required educational hours must be in plant operation. The lab in the water treatment plant is recertified every three years for adhering to regulations. Five times per month the Montpelier personnel conduct tests on bacteria levels at varying locations. Emphasis is also placed on safety with safety meetings held monthly. The Montpelier Hospital Auxiliary thanked Mr. Fritsch for his informative presentation and Vice President Armeda presented him with a token appreciation gift. Following the guest speaker’s remarks, members joined in the auxiliary prayer. Roll call was answered with members’ favorite baked good. February’s bakeless bake sale brought in a variety of recipes and donations for the ingredients from the members. Thought for the day was “Volunteers are love in motion” (author unknown). Reports were given by the secretary, treasurer and various committee chairmen. President Joyce thanked all who participated and helped with the “Lighting of the Way to Christmas” memorial program held in December. The auxiliary’s January meeting had to be cancelled due to inclement weather. Members brought Valentine cards for patients at the Montpelier hospital distributed at the conclusion of the meeting. Deloris Dennis and Mary Cook are in charge of patient favors for the month of February. The next meeting of the hospital auxiliary is scheduled Monday, March 9th at 12 noon with a Soup and Salad Luncheon in the hospital conference room. Members are asked to bring a salad or dessert. Soup and crackers and beverage will be provided. Guest speaker will be Christine Higbie, RN, professor at Northwest State Community College. Members are encouraged to bring a guest. © 2015 – 2016, The Village Reporter and/or The Associated Press. All rights reserved. 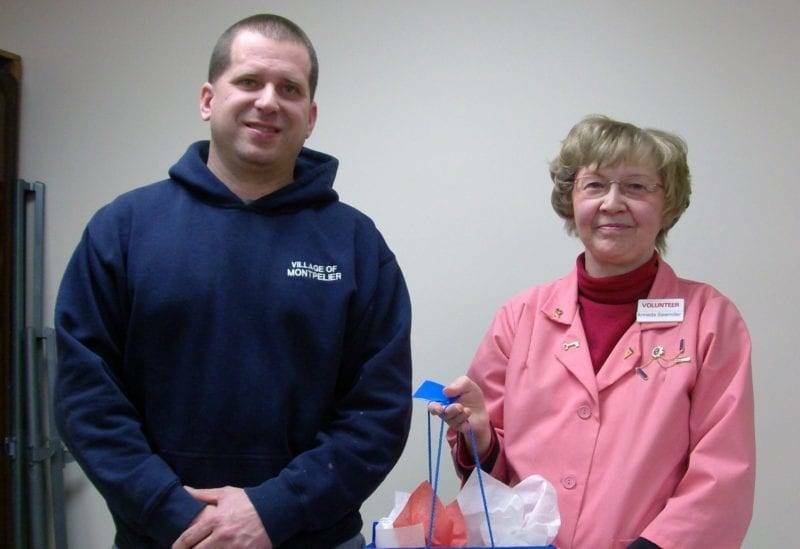 Be the first to comment on "Josh Fritsch From Montpelier Water Treatment Plant Speaks To Montpelier Hospital Auxiliary"